In this sermon I share about the prophecy of the Anti-Christs, the False Prophet and the warnings from Revelation 13. For more visit the Last Days page. What do we do with our fears? Let me offer the perfect strategy in this episode of Recharge Video. “Likes” and “Shares” and “comments appreciated. How can you honor the memory of someone you have lost? Let me offer a suggestion in this episode of Recharge Video. “Likes” and “Shares” and “comments appreciated. How enthusiastic are you about life? Your spiritual life? Let’s talk about it in this Recharge Video.o. “Likes” and “Shares” and “comments appreciated. 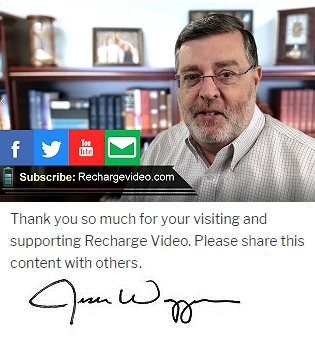 In case you haven’t noticed the look of Recharge Videos has changed. I have been working hard to convert the RV studio to a green screen studio. I thought might want to see how this all comes together. Here’s a quick look at my studio. First I shoot my hook and teaching sections in front of the green screen. Then a video background is selected – this is recorded blurry on purpose.